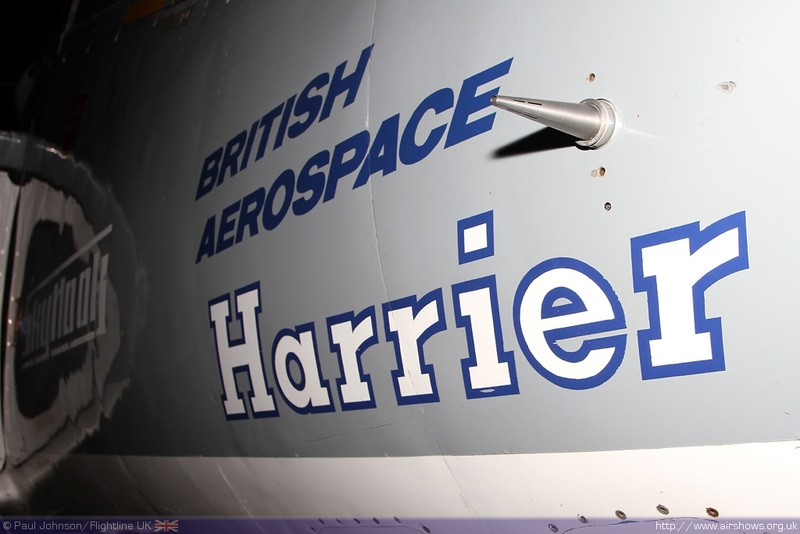 50 years ago on the 21st October 1960, an aircraft that would go on to become a British icon had its first, slightly shaky first few moments of flight. 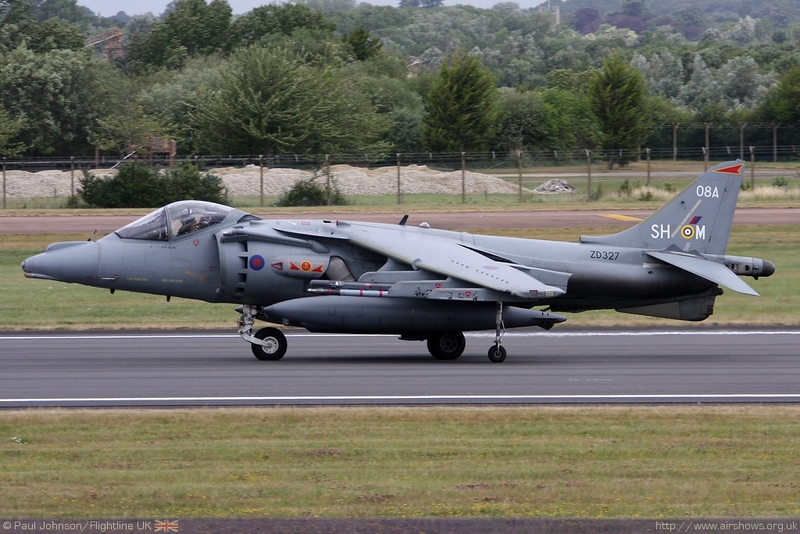 Unusually the aircraft was tethered to the ground by cables at the secretive Dunsfold Aerodrome in Surrey. 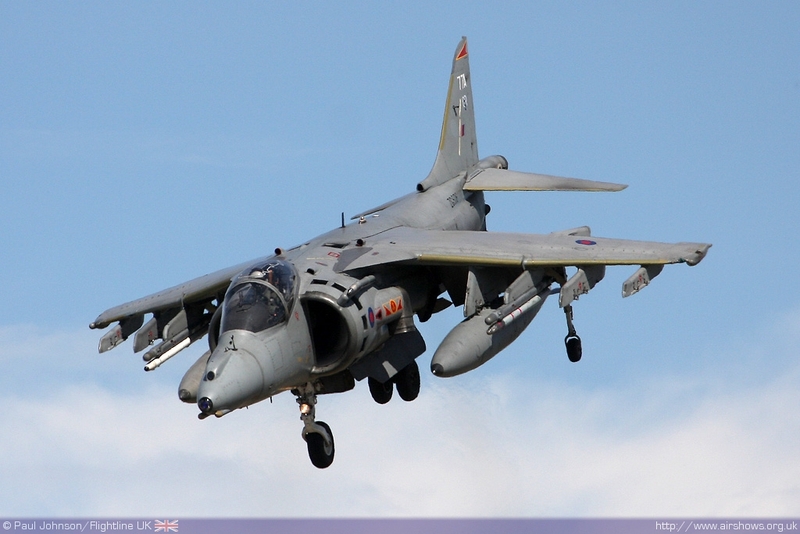 That aircraft was the Hawker P1127 - the forerunner of the "Harrier Jump Jet!" 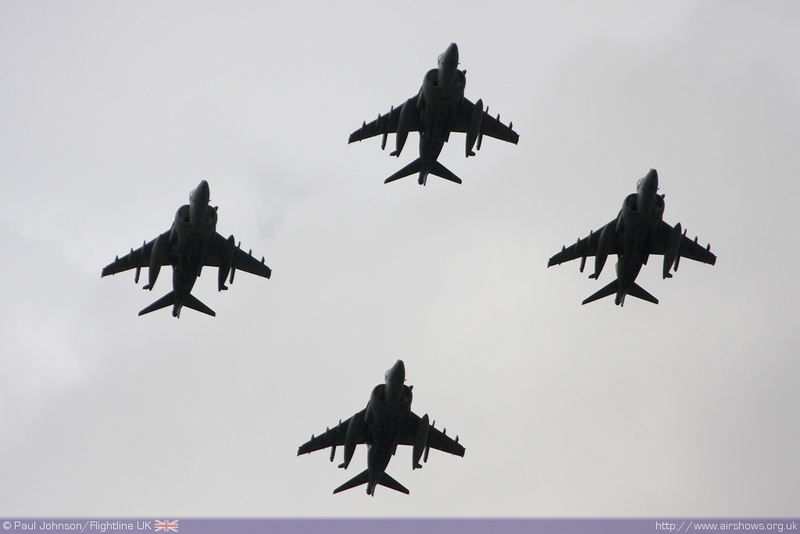 50 years on, the Harrier is still in service with the RAF, albeit in the much developed Harrier GR9 form but not for much longer. 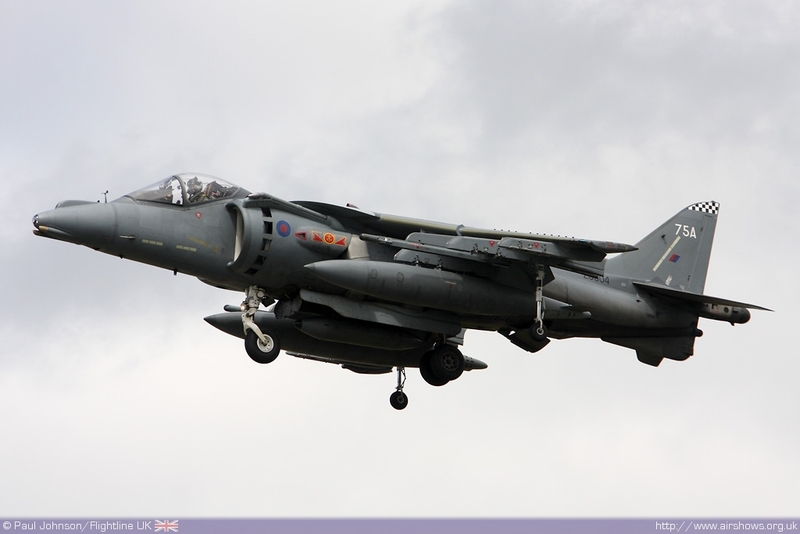 In October 2010 it was announced that the Harrier would be retired from UK military service as part of a comprehensive Defence review and Harrier operations would cease by the end of the year. 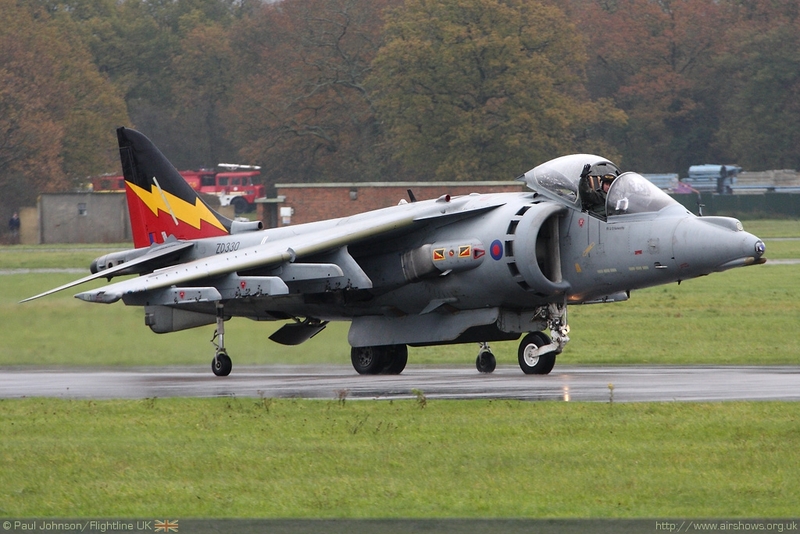 Dunsfold Park marked both the first and possibly the very last Harrier flights at Dunsfold with a special event on the 16th November. 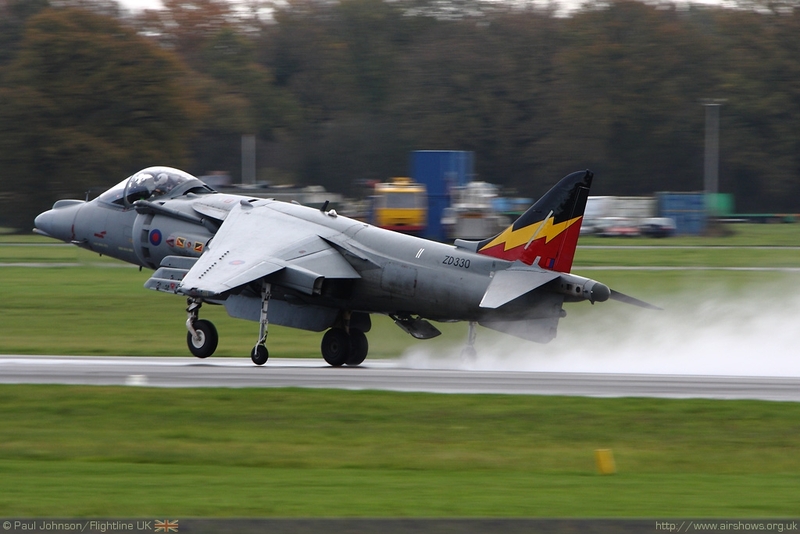 Paul Johnson/Flightline UK reports from Dunsfold and 50 years of airshow magic. Photography as credited. 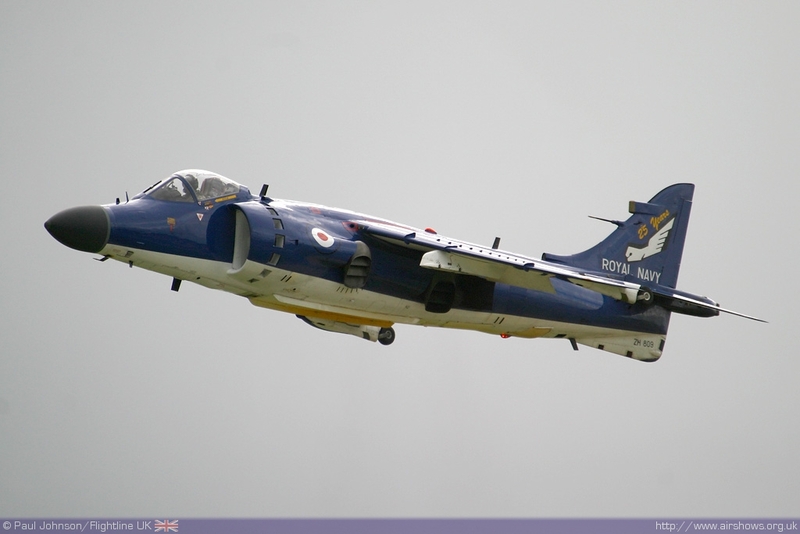 The Hawker P1127 conducted its first hovering trials at Dunsfold on the 21st October 1960 in the hands of test pilot "Bill" Bedford who has famously broken his leg in a car accident just before the first trials. It was not until the 19th November 1960 that the P1127 first hovered freely. 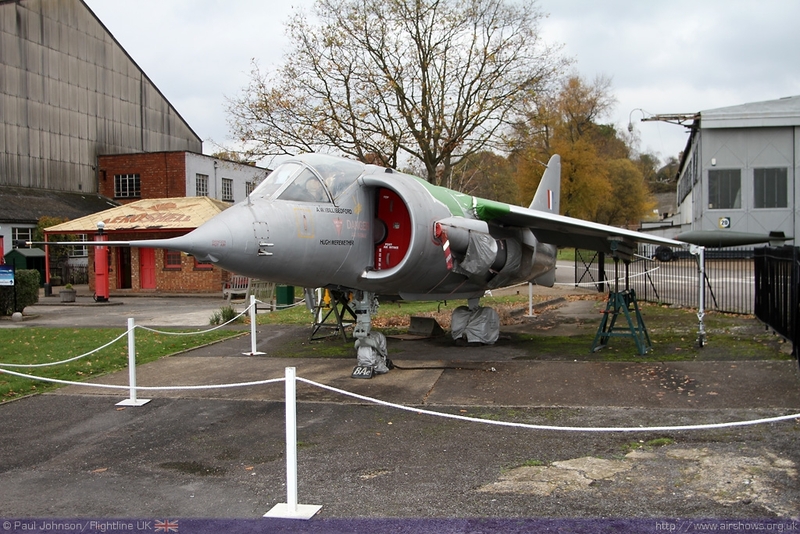 The 13th March 1961 saw the P1127 complete its first conventional flight, this time from the rather longer runway at RAE Bedford prior to the first flight transitioning from the hover to forward flight in September 1961. 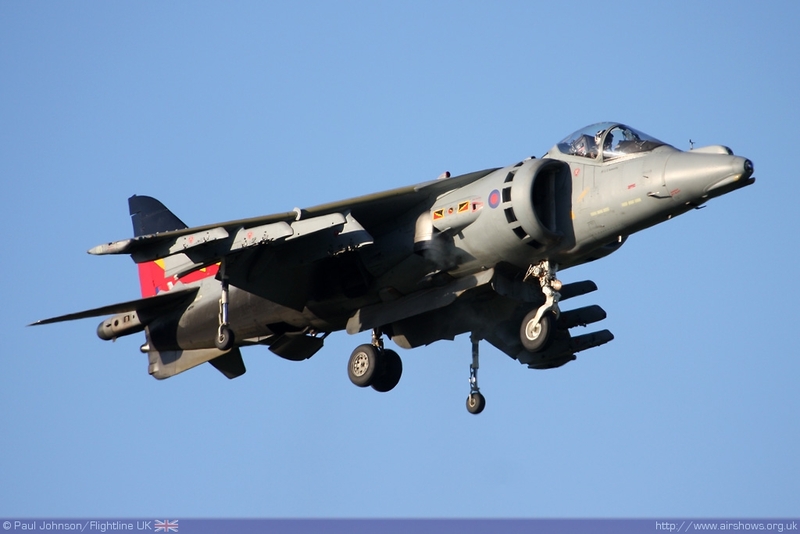 Between 1960 and 2000, Dunsfold was the "home" of the Harrier completing testing on all the major marks from GR1 to GR7 and Sea Harriers before testing moved to Warton following BAE Systems withdrawal from the site. 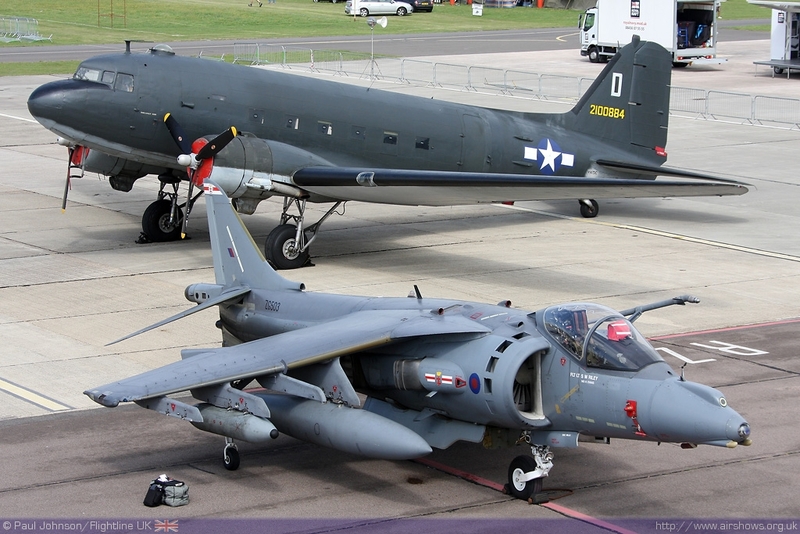 Ever since the P1127 made its first airshow appearance, it and latterly the Harrier have been a highlight of any show they've attended. 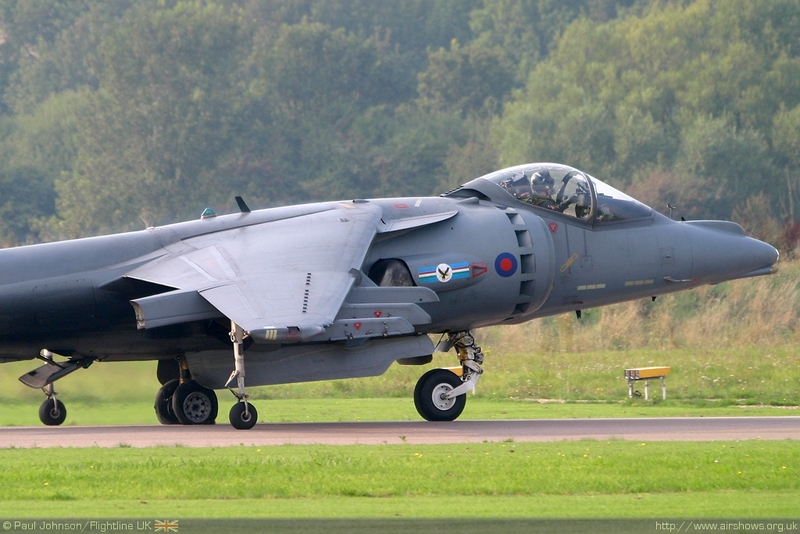 The unique capabilities of the Harrier made for exceptional airshow appearances. 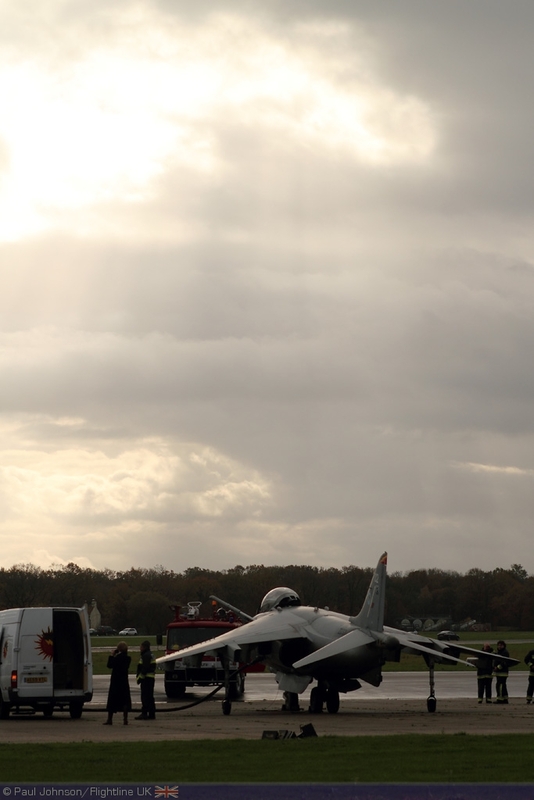 In the very early years, the P1127 was pitted against the Dassault Mirage VIII, an incredible development of the French Mirage III with eight lift jets as well as the main powerplant to meet a NATO request for a VTOL fighter. 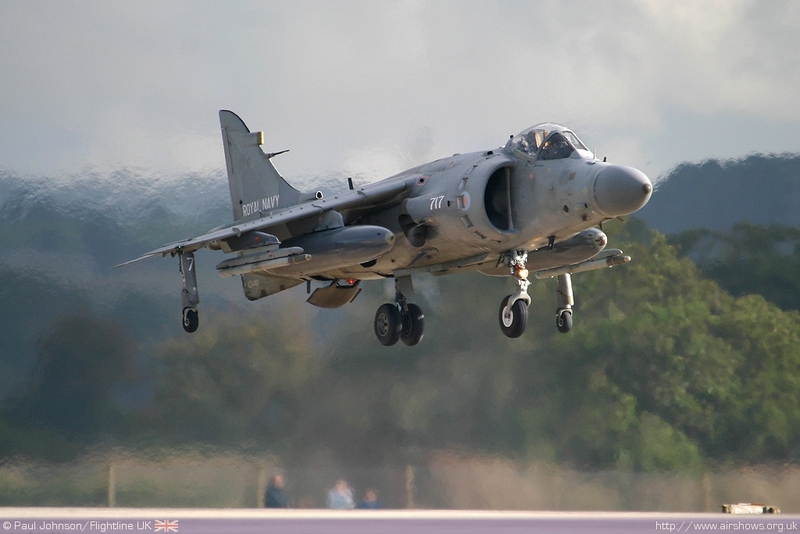 In the end, the P1127 concept won but the proposed P1154 design was cancelled and a more potent version of the P1127 was developed into the Harrier. 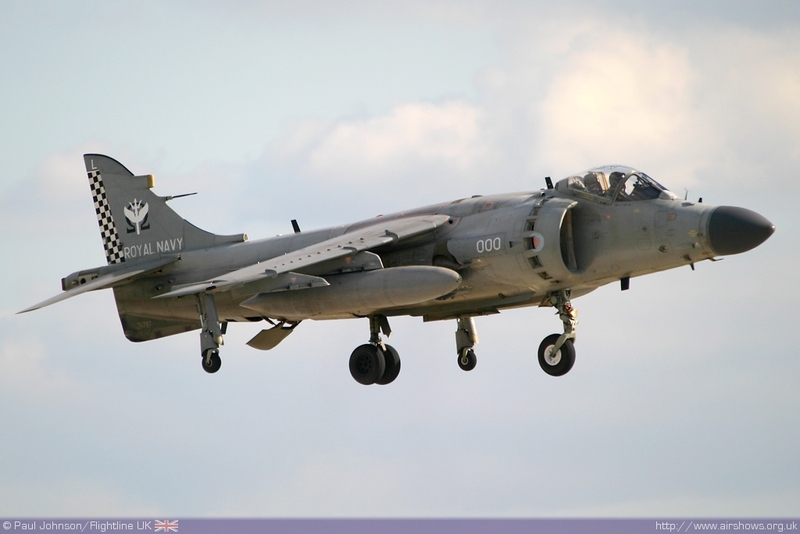 Those early flights were not without their set backs and perhaps the most public of those occurred at the Paris airshow when Bill Bedford made a very heavy landing breaking the landing gear off on the reinforced pad designed for the Mirage VIII! 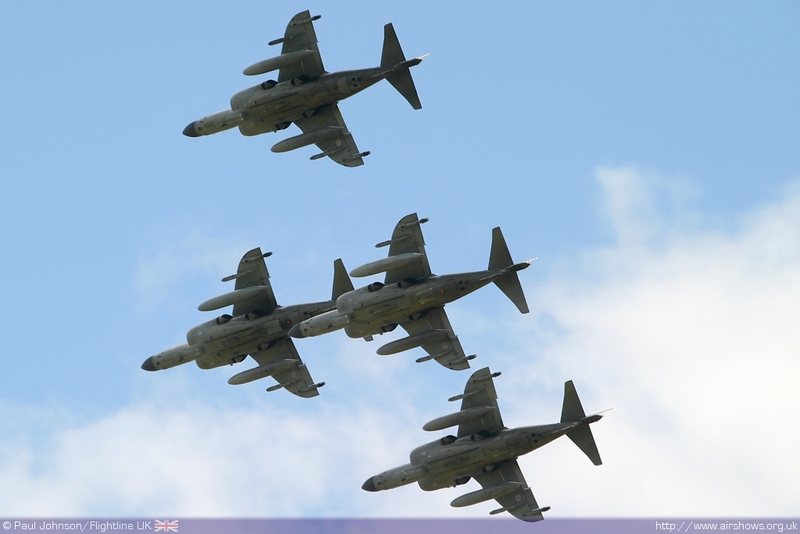 Once in RAF service, it was not long before the Harrier was making regular airshow appearances. 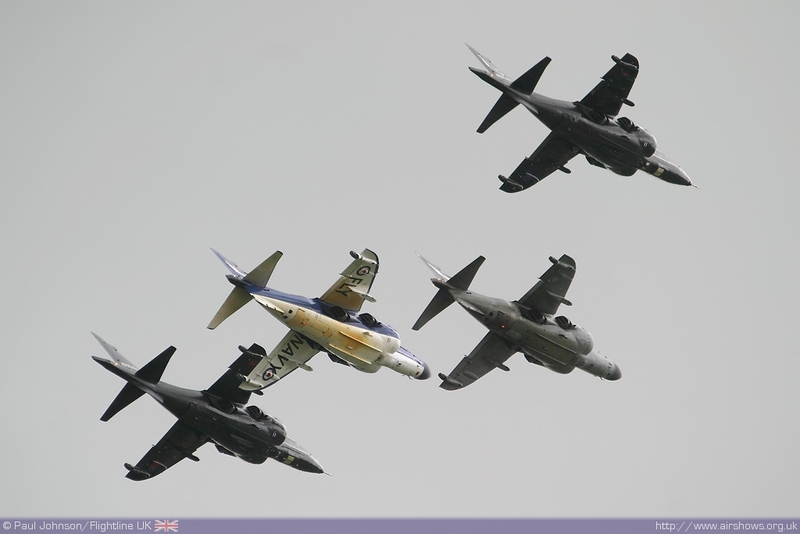 The sheer spectacle of watching a heavy fighter stop in mid air and bow to the audience was absolute magic at an airshow, and the noise of the Pegasus powerplant made sure everyone knew the Harrier was displaying. 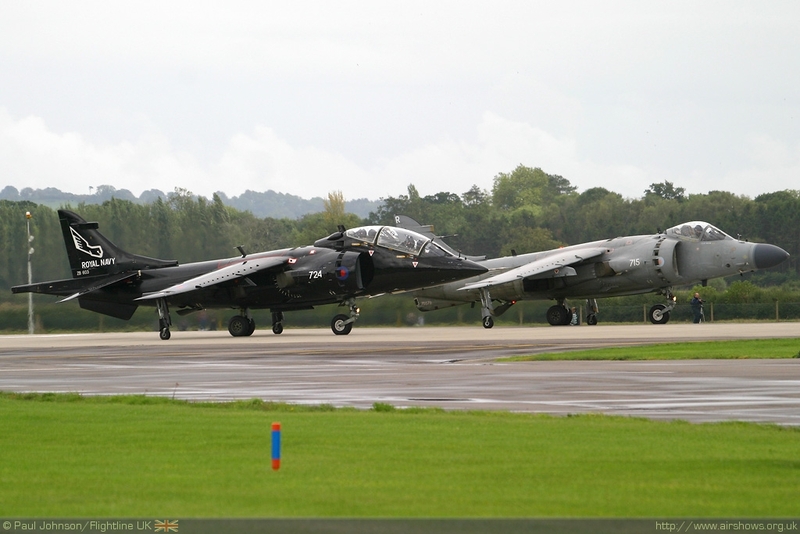 The unique capabilities of the Harrier made it possible for the jet to operate from short runways and grass airfields allowing many more events to host an appearance from an RAF front line fast jet. 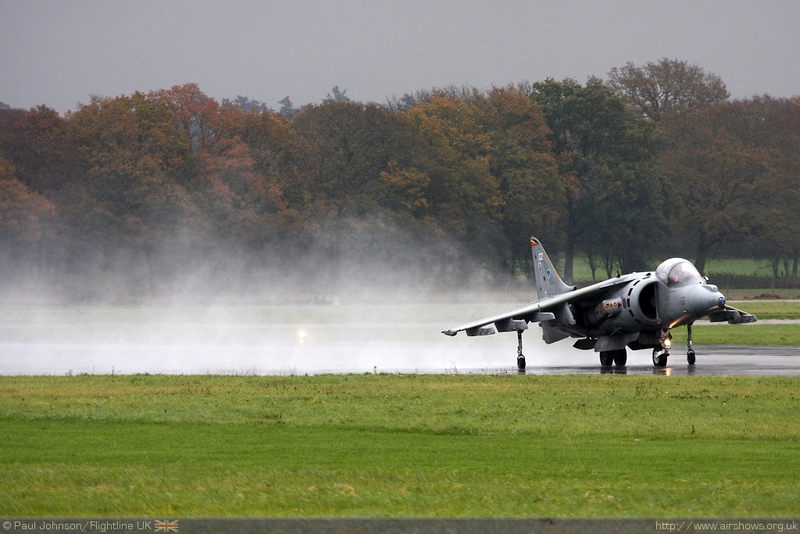 The Harrier was always a special sight displaying at venues such as Old Warden and Middle Wallop. 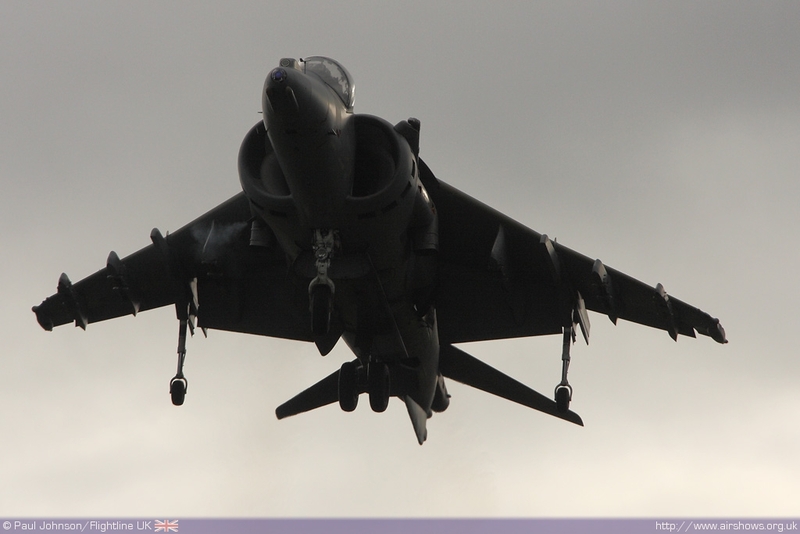 Often one of the best places to catch some "Harrier action" was the annual RNAS Yeovilton Air Days. 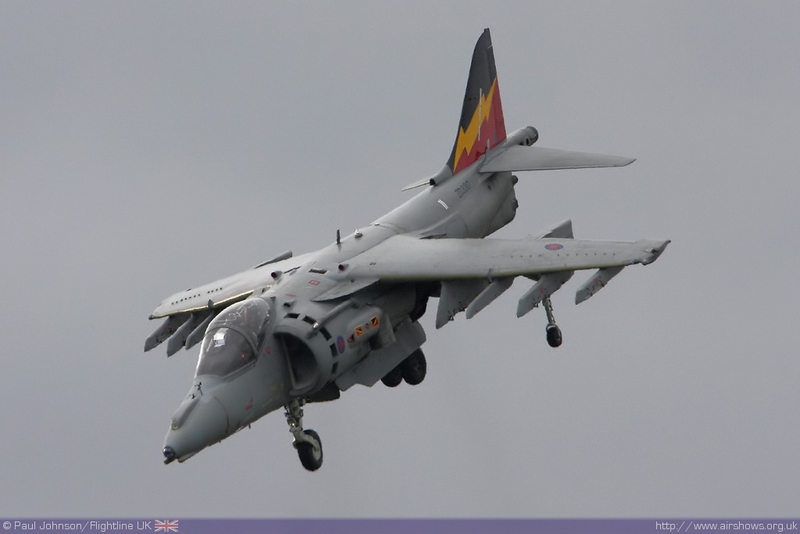 The based Sea Harriers not only provided solo displays, but featured well in some special flypasts as well as the traditional "Commando Assault" finale. 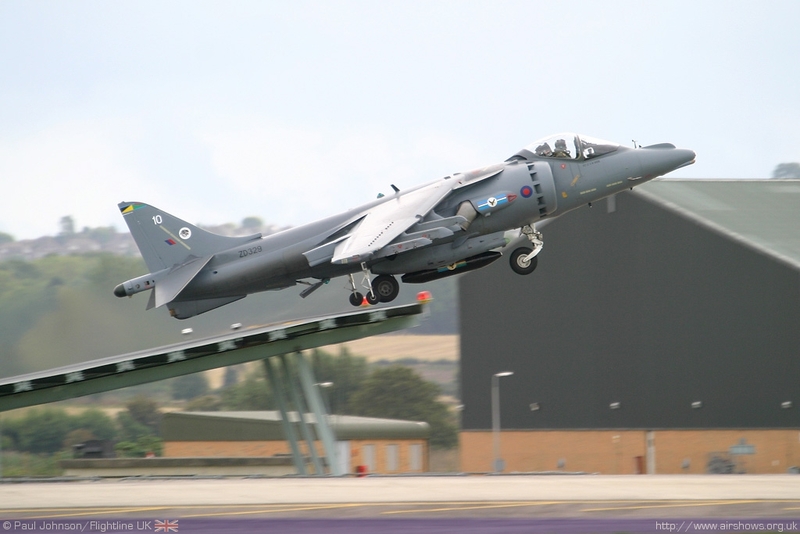 Another good venue to see Harrier displays from was Shoreham where the aircraft was a regular star operating from the apron in front of the Terminal building. 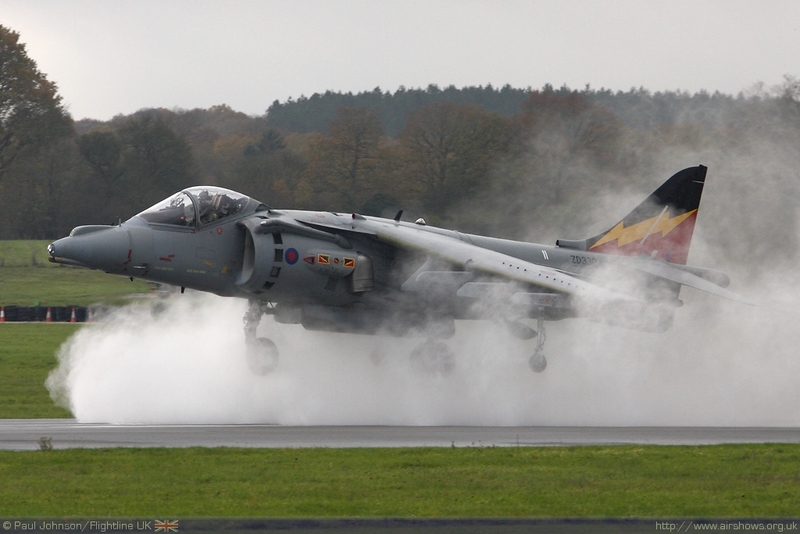 Seaside venues also provided unique opportunities to see Harriers kick up impressive amounts of spray as they bowed to appreciative audiences gathered on the beaches. 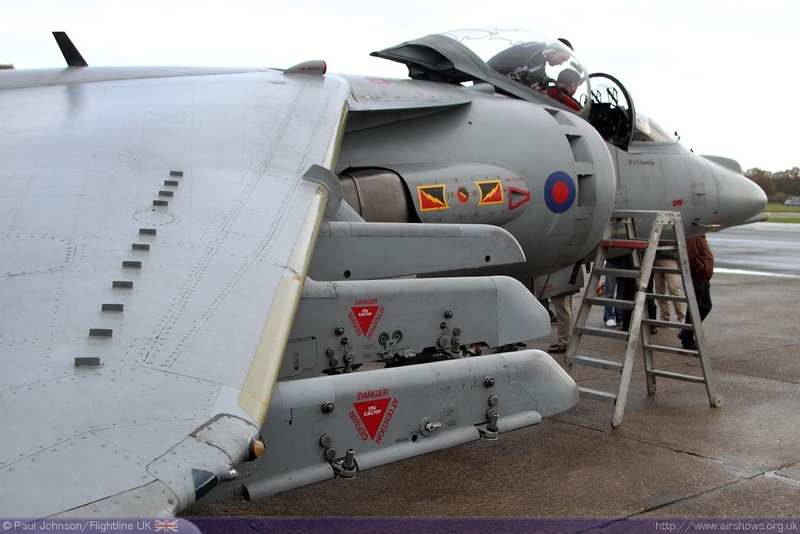 Recent years have seen very few airshow appearances of Harriers. 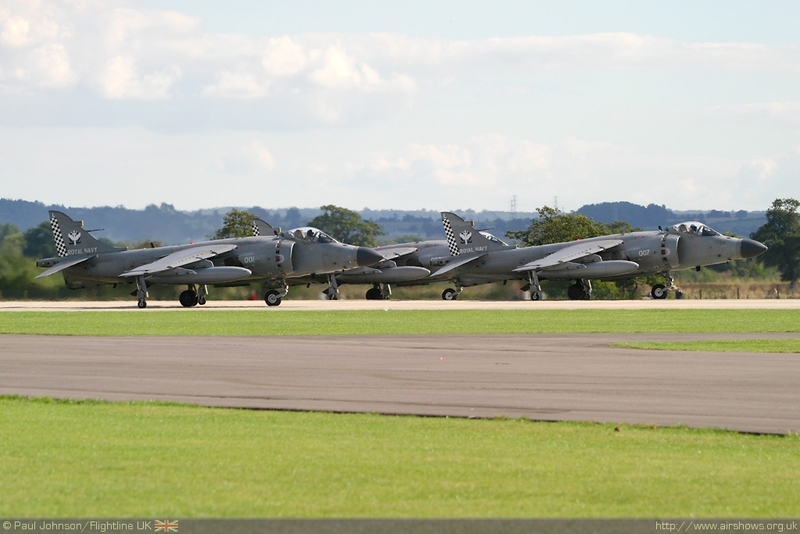 The retirement of the Royal Navy's last Sea Harriers in early 2006 saw all Harrier operations concentrated on the Harrier GR7/9 fleets at RAF Wittering and Cottesmore. 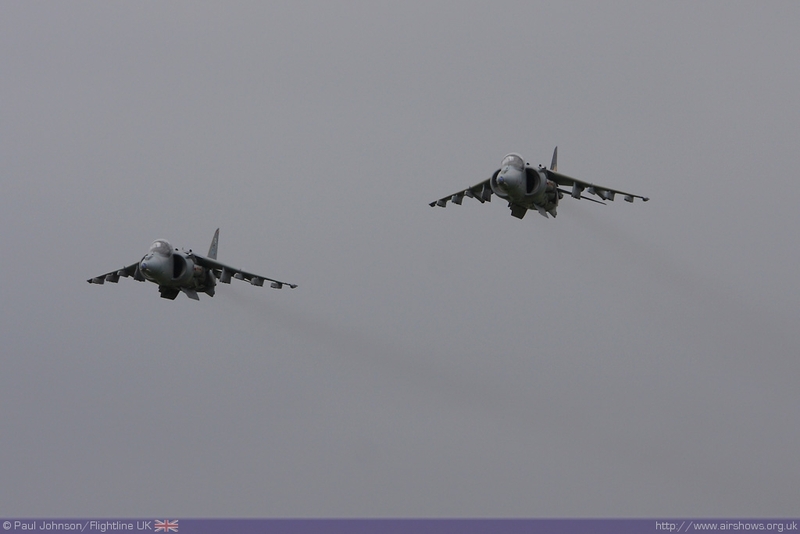 Furthermore, Harriers were heavily committed to operations over Afghanistan. 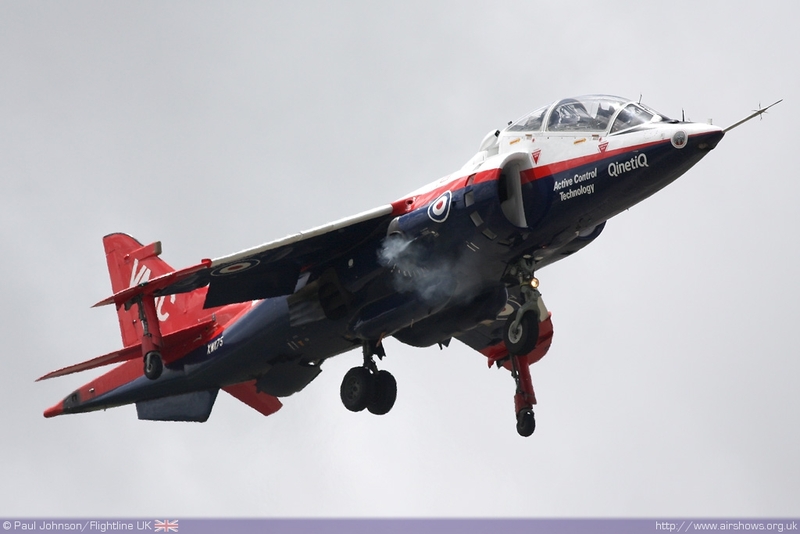 Occasionally, one or two aircraft would make it to airshows, notably at Yeovilton which even managed to attract the first and possibly last ever flying display appearance of QinetiQ's VAAC Harrier T4 in 2008. 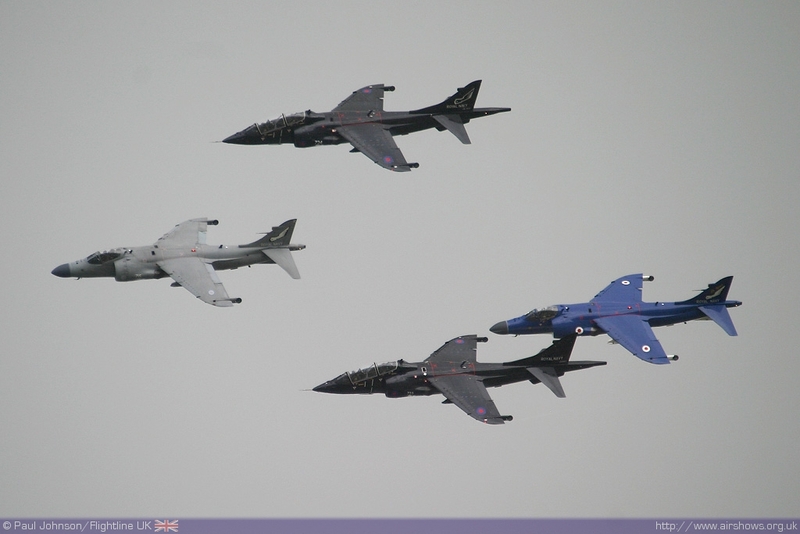 2009 saw the Royal Navy celebrate 100 Years of Naval Aviation with a flypast that toured several events and saw Naval Strike Wing Harrier GR9s participate in flypasts over RAF Fairford and Liverpool. 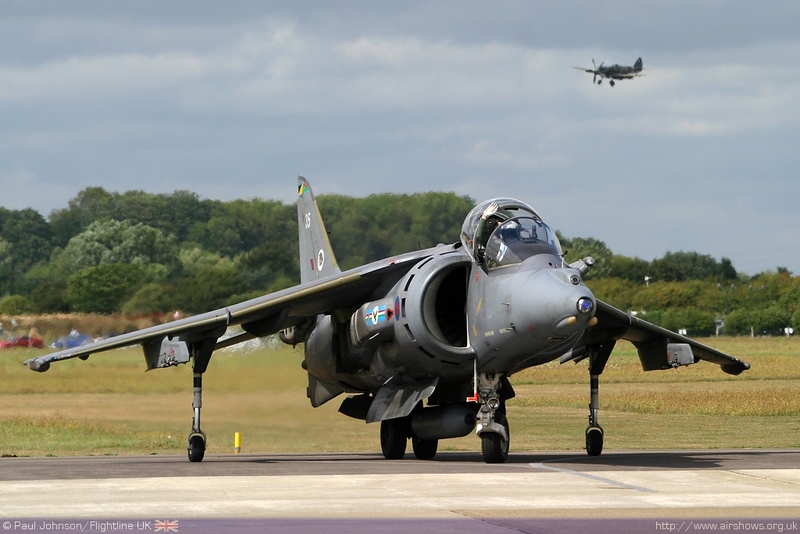 2009 also saw a No 41(R) Squadron Harrier GR9 participate in Shoreham Airshow's static display for the first time. 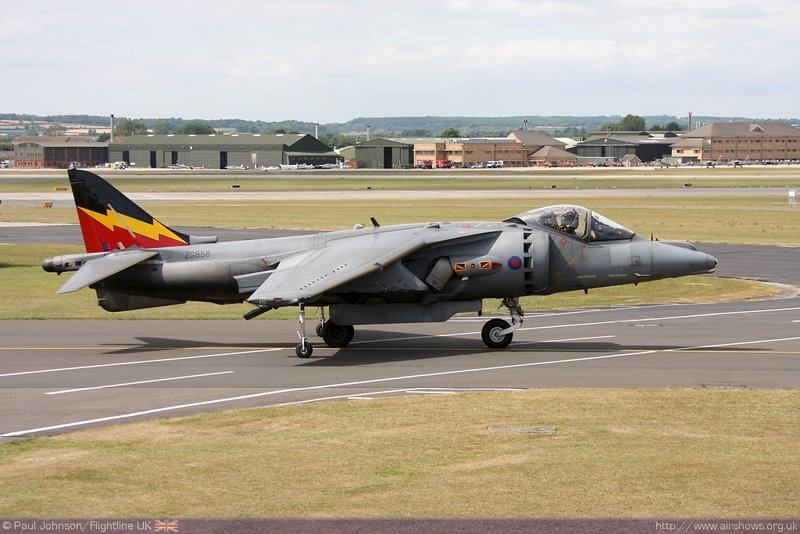 2010 saw the Harrier return to the airshow circuit after a four year absence with a role demo supplied by No IV(R) Squadron and flown by Sqn Ldr Steve Kenworthy. 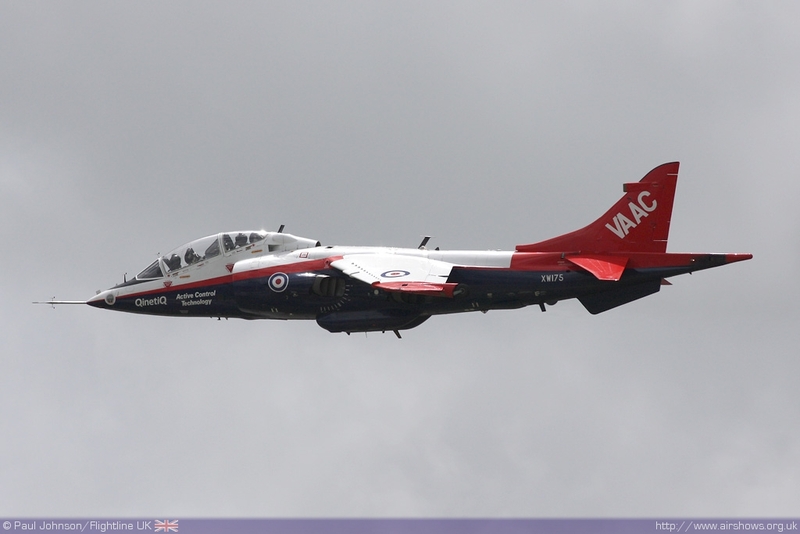 The team took in 10 public displays appearing at Skrydstrup in Denmark, Cosford, Biggin Hill, Waddington, Yeovilton, RIAT at Fairford, Sunderland, Shoreham, Dunsfold and Leuchars. 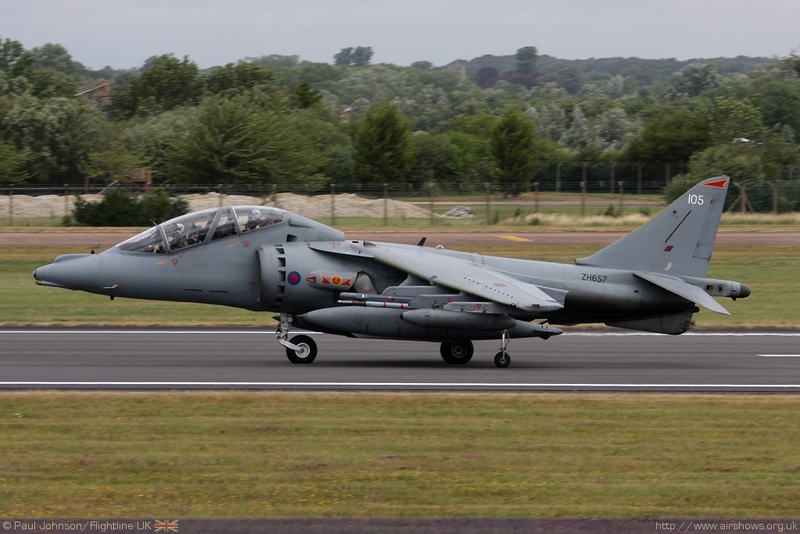 Later that year in October, it was announced the Harrier would be retired from service with the Royal Air Force and Royal Navy in favour of keeping the Tornado. 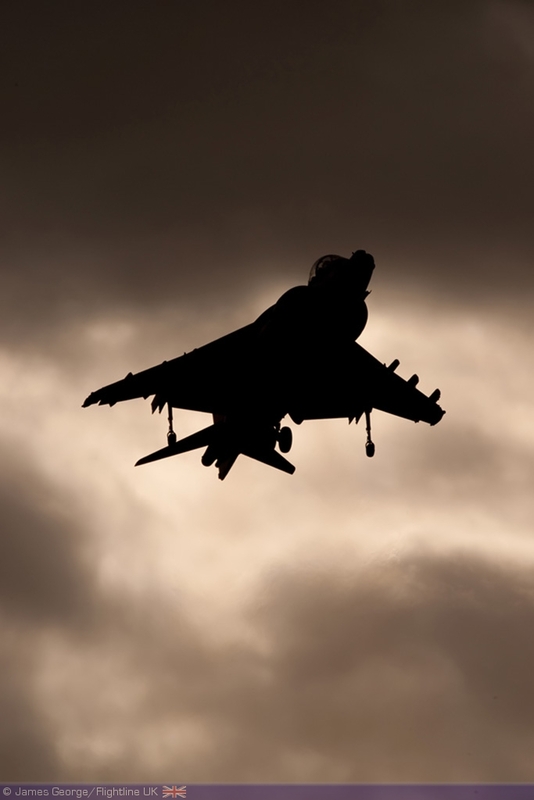 It was also announced that the order for the F-35 Lightning II was to be switched to the conventional F-35C carrier based fighter rather than the V/STOL F-35B bringing to an end 50 years of British military V/STOL jets. 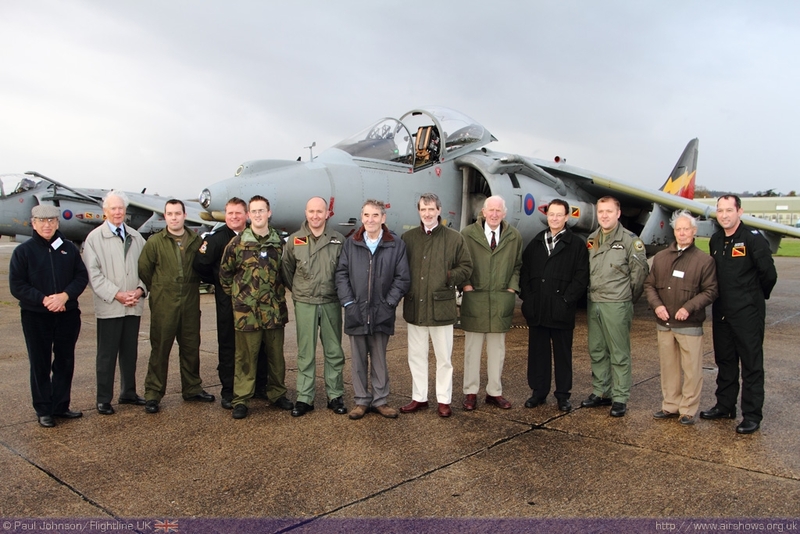 While many will point to the loss of an important asset, it should also be remembered that the end of the Harrier also leaves many servicemen and women as well as civilian contractors with uncertain futures - we all of them the very best. 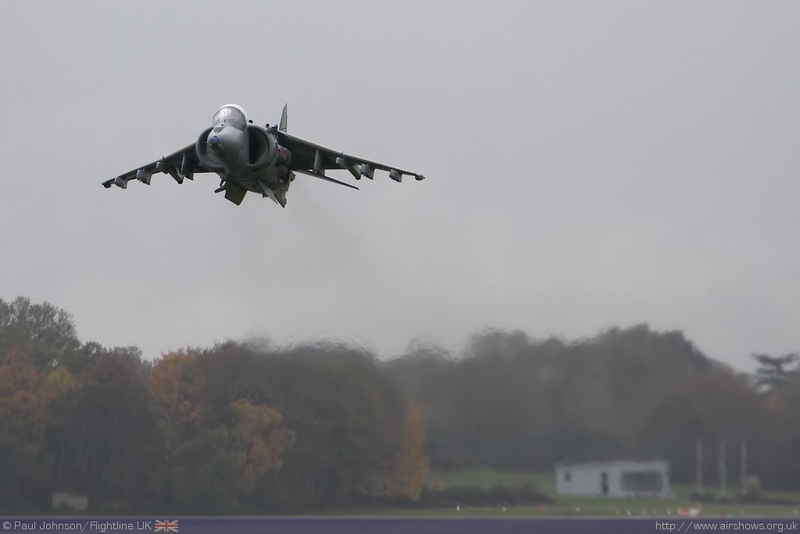 The rapid drawdown of the Harrier has caught many by surprise with mid-December likely to mark the end of Royal Air Force and Royal Navy Harrier operations at RAF Cottesmore and Wittering. That means there will be no public events to mark the retirement of the type. The event on Tuesday 16th November did not go exactly according to plan. 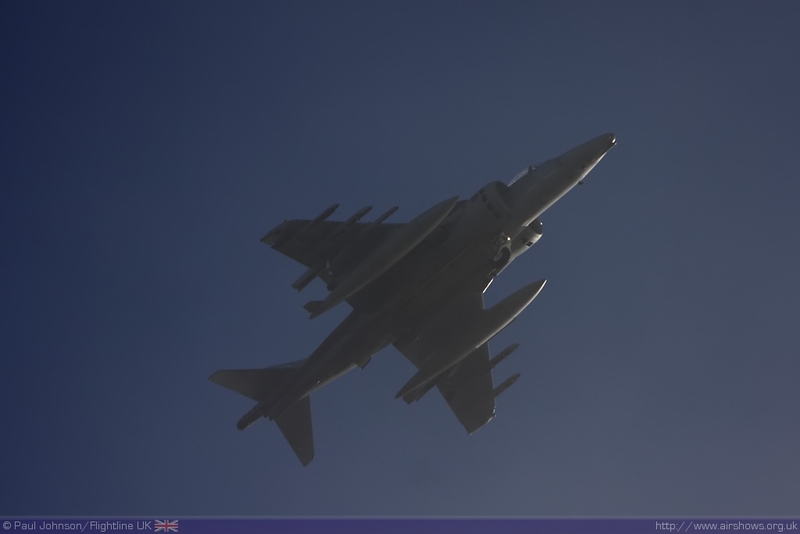 Dense fog plagued much of the South East of England all day and though the aircraft were able to make it overhead Dunsfold, the fog prevented them landing. 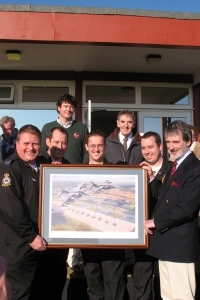 However, the Harrier Display Team ground crew were present as were a host of Harrier icons including test pilots Duncan Simpson and John Farley as well as Members of the Hawker Association. 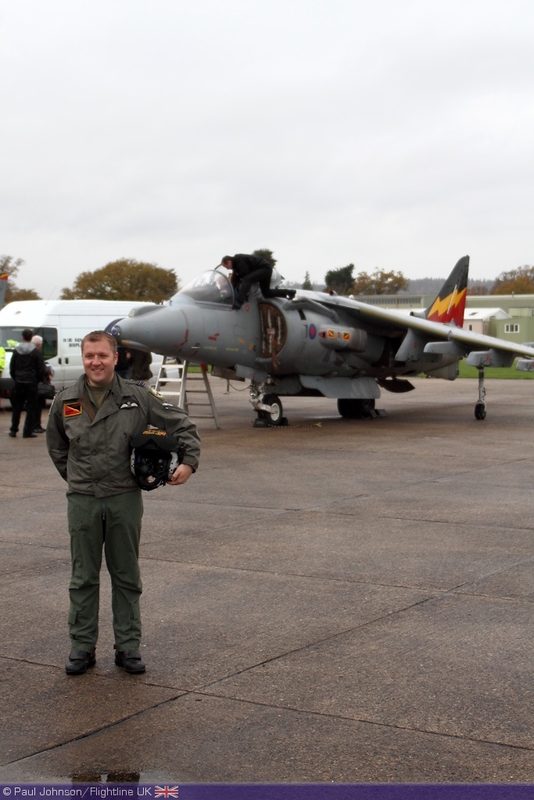 The Harrier Display Team was supported on the ground by Display Team Manager Sgt Si Feetam, Senior Aircraftsman (Tech) Ben Daly, Sgt Chris Harker and Sgt Steve Buck. The crew took the opportunity to present Jim McAllister with a limited edition print of the Harrier which encompassed all models built over the last 50 years. 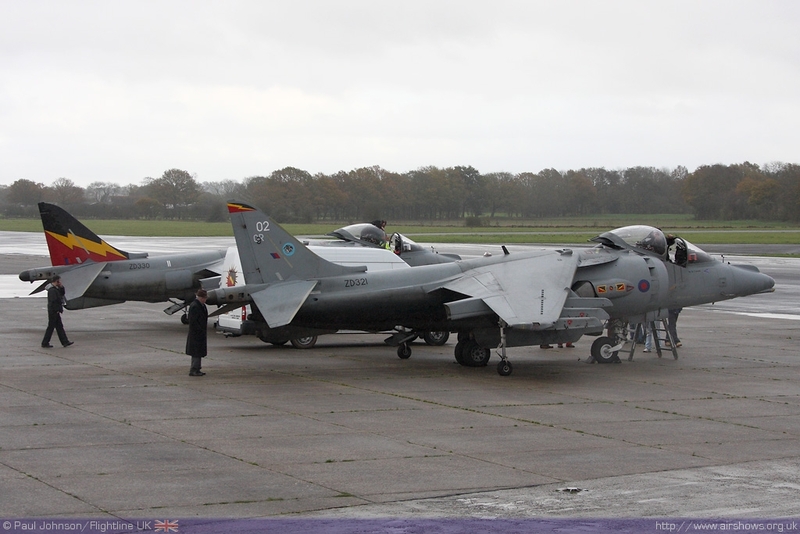 Not to be out-done by the British weather, the Harrier Display Team made plans to return to Dunsfold later in the week on Thursday 18th November, closer to the actual date of the P1127's first free hover. 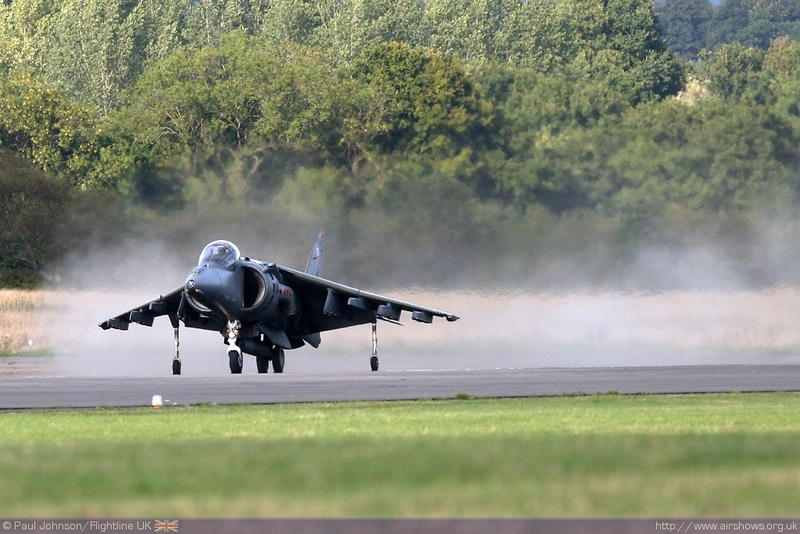 Wg Cdr Simon Jessett and Flt Lt Darren Kups from IV(R) Squadron brought a pair of Harrier GR9s from RAF Wittering for a spectacular landing on Dunsfold's wet runway after a brief hover demonstration. 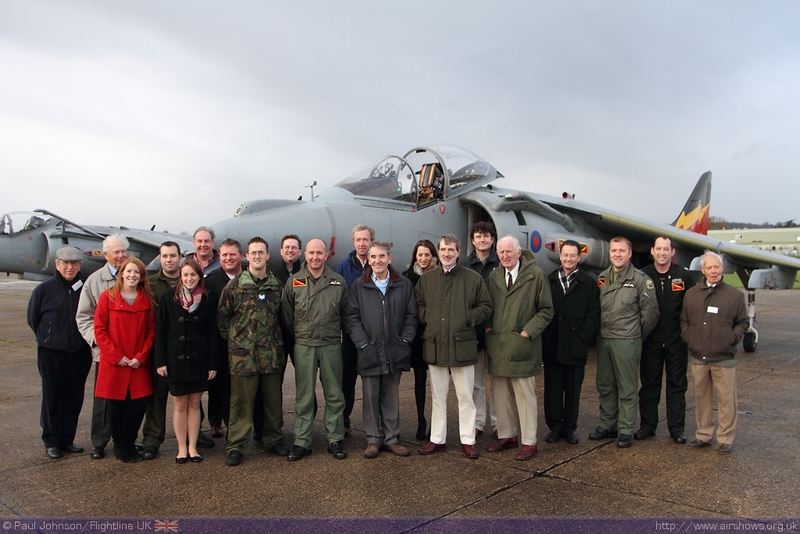 They were met by Harrier test pilots John Farley, Duncan Simpson and Chris Roberts amongst the invited guests. 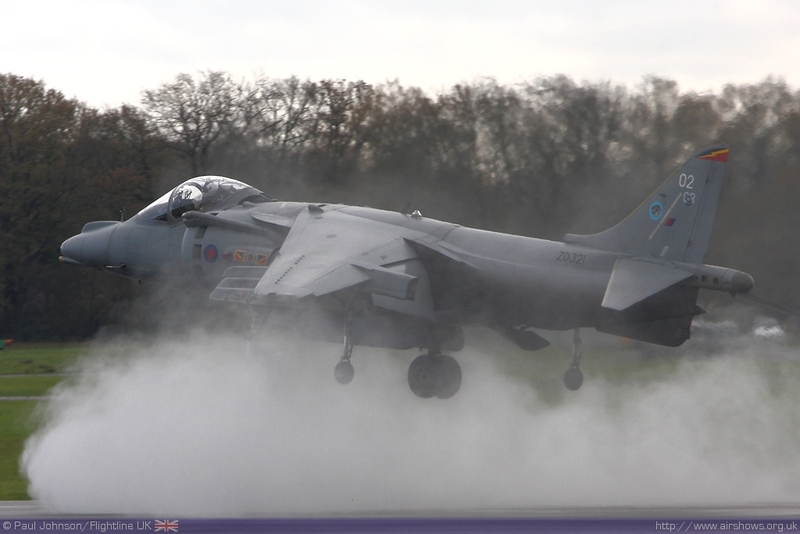 The aircraft were on the ground for around two hours allowing the guests to get up close to the machines. 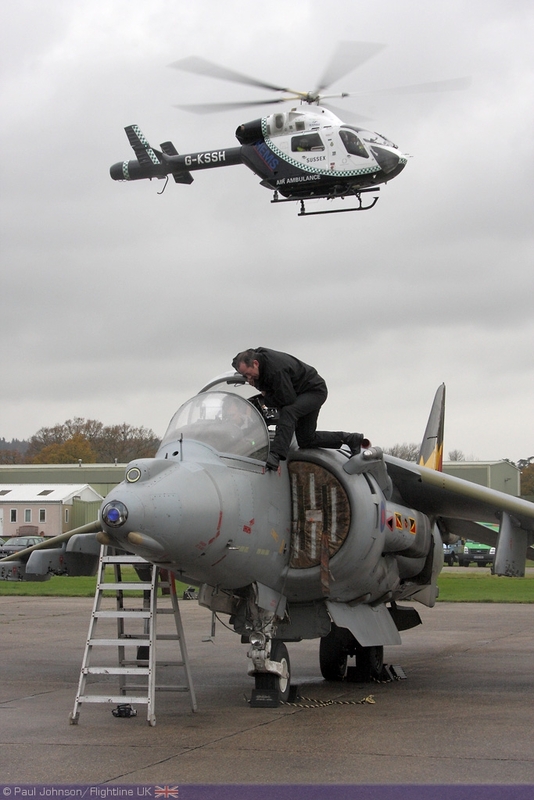 One of Dunsfold's current residents, the Surrey and Sussex Air Ambulance also got in on the act hovering around the aircraft for the photographers while the ground crews gave guided tours of the Harrier cockpits. 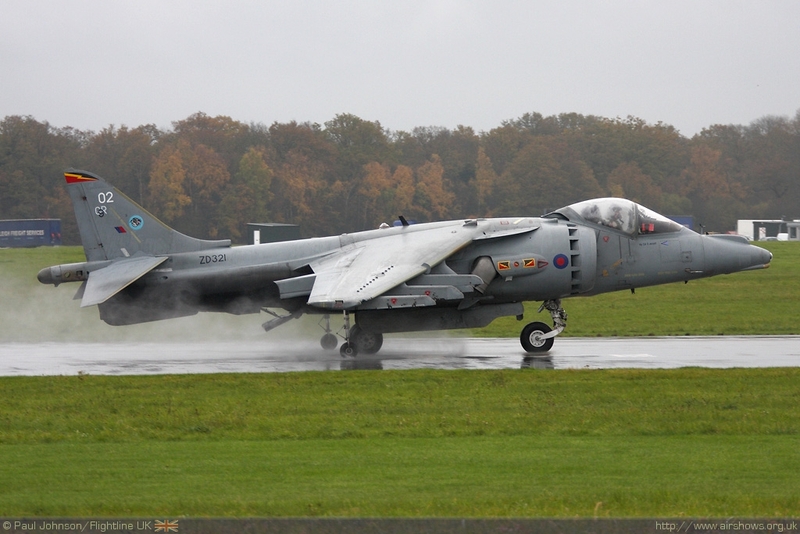 The weather steadily closed in, and by the time of the aircraft's departure Dunsfold was surrounded by low cloud and rain which was wonderful for watching the Harriers get airborne, but may have prevented a final flypast over the Harrier's "home." 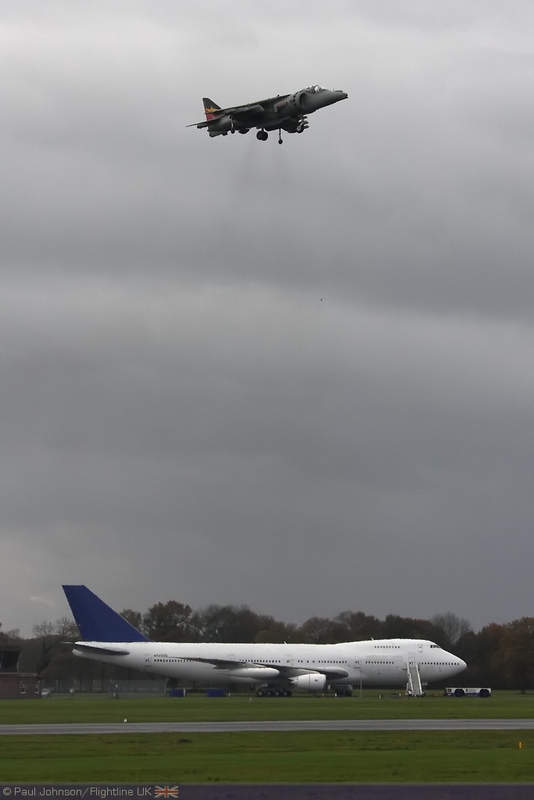 For many attending the event like myself, it was a last chance to see these unique aircraft in action before their premature retirement which made the day all the more special and emotional. 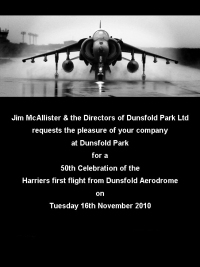 We would like to thank Jim McAllister, Gerry Forristal, Nancy Edwards and the rest of the staff at Dunsfold Park for staging the event and their generous invitation.